Looking for eGo battery with Variable Voltage (VV)? This Smoker's Angel eGo battery with variable voltage features I've been using for four weeks now. You'll find it on their site under the name of Smok Winder Variable Voltage Battery. Of course it has the same popular eGo 510 threading, so you can buy clearomisers everywhere. On the outside this eGo battery resembles a very popular eGo Twist. The only visible difference is that due to its higher capacity it had to be wider in diameter. It's only two mm more than standard 14mm you've been all used to, but it's clearly visible, like in the above pic where you can see it compared with Smoker's eGo Winder VV. Also, it has markings at the bottom showing five voltage levels you can set your battery to – 3.2V – 3.6V – 4.0V – 4.4V – 4.8V. Now, if you know nothing about which voltage to use depending on your clearomizer's resistance, you need to read what follows. 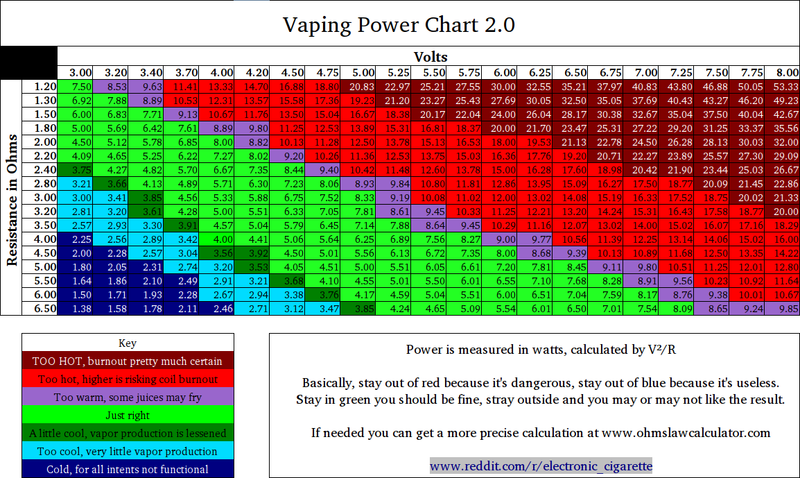 For those of you just starting, here's a link to the volt-ohm chart that will help you find ohm ratings to match your chosen voltage or other way round, so that you can find what's commonly referred to as „your ideal vape“. This 1300mAh capacity means much to heavier vapers. In my case this eGo VV battery life is a day and a half when coupled with some of standard clearomizers that don't have too low resistance, like CE4 or Kanger EVOD. I vape all day long, so having to charge it every other instead of every single day is a great change. Charging time is around 4hrs. To some it may seem too big, but I had used L-rider Lambo (with batteries around 2000mAh) and can say this: Lambo is much, much heavier and not so much better in performance. I'd always rather use eGo VV than Lambo. Anyway, if you're looking for eGo battery with variable voltage in UK, this is the battery to choose. Together with Aspire BDC (bottom dual coil) clearomisers you can see in the picture, it makes a pretty powerful combo. UPDATE from Spring 2015 - this battery sale has been discountinued. Read more about Vision/Vapros Spinner 2 1650mAh, another solid, and even more powerful battery with adjustable voltage I've been using for a while now. As for eGo twist which is also a good one, at Virgin Vapor you can buy a genuine Joyetech eGo Twist for only $20.99. Buy Smoktech eGo Winder VV Battery at Panda.